Everyone wants success, but at what costs? The storyline of Merrily We Roll Along isn’t anything revolutionary or extraordinary, and the conflicts of the musical are pretty predictable, but the deeper meaning behind the storyline is still profound. Frank Shepard’s desire for money and success ruins the relationships that mean the most to him, and as we see the moments in his life that acted as either subtle pathways or dramatic turning points, we reflect on our youth and hope for a brighter future. Runyonland Productions took an in-concert approach to this Sondheim musical. Providing a vibrant blast of music onstage, the 12-member orchestra music directed by Brian Rose and conducted by Tyler Driskill brought Sondheim’s score to life. 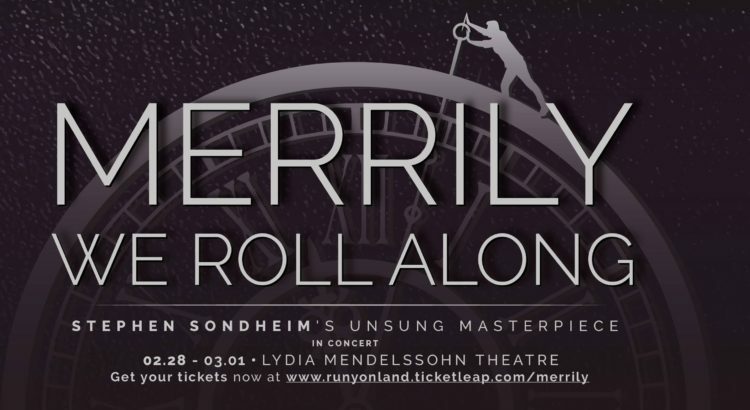 The company’s transition in between the years, the title song “Merrily We Roll Along,” was a catchy melody that conveys the theme of the musical. The entire cast’s performance was pretty spectacular, but if I had to pick just one outstanding number, it would be Emilie Kouatchou’s strong and heartbreaking performance of “Not a Day Goes By,” one of Sondheim’s greatest songs about lost love. However, all the songs were performed brilliantly, such as Charley’s breakdown on air with “Franklin Shepard, Inc.,” a frantic song with dire consequences. Due to illness, Thomas Laub provided the voice of Charley while Wilson Plonk acted onstage. This unexpected change didn’t deter from the production much, and the performances of both Plonk and Laub are to be applauded. Erica Ito, who played Mary, also sang powerfully and captivated the audience with every note sung and drunken word slurred as she desperately tries to keep her closest friends together. Liam Allen captured Frank Shepard’s confusion and regret in his later years in a somber way, as well as his selfish vanity and ego in his youth with a relatable aspirational mindset. As he continues to make poor choices that ruin his relationships with his wives and friends, you can see the toll it takes on Frank, who carries less weight on his shoulders with each retrospecting scene. The very last scenes of the musical captures Frank in his early 20s, an age that many college students can relate to. With a bright-eyed optimism and naive hope, they sing about conquering each day and crafting their lives the way they want. Though the stories of Frank, Charley, and Mary end poorly, “Our Time” is still an anthem of hope for the future. By watching this musical, it is important to recognize that hopes and dreams don’t necessarily evolve in a positively linear path to success. It can be messy, and there may be pain and regrets along the way, but as we can learn from Frank’s life, it’s never too late to take responsibility for your actions and choices, and it’s possible to reach success both professionally and personally without sacrificing one for the other. If there’s one thing to take away from this musical, it’s to never lose sight of what’s important.